Lee writes: Can you save PDF files (like a camera manual) onto Apple devices so you can read the manual over several sessions without having to reload the PDF file over the Internet repeatedly? I can do it on Android and Windows operating systems but can’t figure how to save the file on iPhone. Hi Lee! Yep, you can download a PDF file from the web to your iPhone—or an iPad, for that matter. All you need is a PDF-friendly app that’ll let you store PDF files on your device. For example, you can open and save a PDF in an e-reader app like iBooks or Amazon’s Kindle app. You can also open a PDF in a desktop-syncing app like Dropbox or Google Drive, perfect for keeping copies of a PDF on all your Dropbox- or Google Drive-connected devices. First, make sure you’ve installed a PDF-viewing app that can actually save PDF files to your iPhone. Plenty are available in the App Store, but I recommend one of the four mentioned above: iBooks, Kindle, Dropbox, or Google Drive. All set? Now, go ahead and open a PDF file on the web or in an email. 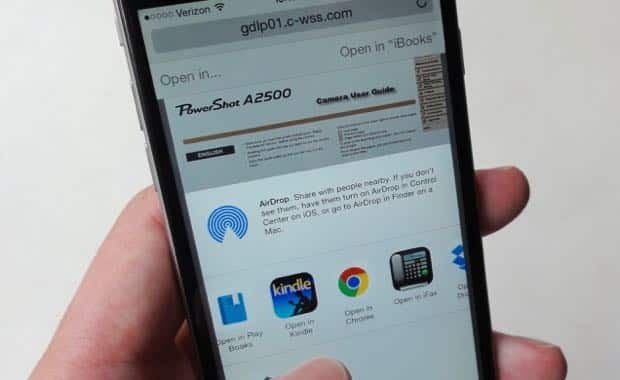 If you opened the PDF in your iPhone’s Safari web browser, you’ll briefly see a pair of buttons at the top of the screen: “Open in…” and “Open in [name of app].” Tap the screen to make those buttons reappear, then tap the “Open in…” button. Did you open the PDF in the body of an email? If so, open the PDF, tap the Action button (the square one with the upward arrow) in the top-right corner of the screen. Next, a menu of PDF-viewing apps will slide up from the bottom of the display. Tap the one you want to use, and the PDF file will open in the app of your choice. If you picked either iBooks or Kindle, the app will automatically be saved to your phone’s memory. To open the PDF again, just launch either app, then browse the “PDFs” section of your iBooks library or “Docs” in the Kindle app. For apps like Dropbox and Google Drive, make sure to save the PDF for “offline” viewing. In Dropbox, open the PDF, tap the three-dot menu button in the top corner of the screen, then tap Favorite. For Google Drive, tap the little “i” button next to the file’s name, then make sure the “Keep on device” setting is switched on. Looking for more iPhone tips? Click here!